On Jan 6, 2015, Chris Hills, author of "Gold Pans and Broken Picks", presented the topic "Gold Mining in the Tinton Region" to over 75 people of the Spearfish Area Historical Society. Chris included old photographs to illustrate his talk. Chris reported that the first gold in the Black Hills was found in Iron Creek and second in Potato Creek. Frank Bryant found gold in downtown Deadwood on Blacktail Creek downstream from Central City. 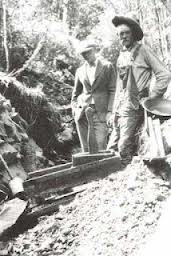 Other sites for gold were Beaver Creek and Sand Creek (photo of Ed Sussingham in the creek with iron soled boots). Thomas Mallory started the Gold Star claim adjacent to the original Homestake Claim; Mallory sold out to Hearst who expanded the Homestake. The miners from Bear Gulch had a favorite donkey and used to bring the donkey to Spearfish. Once when the donkey was left in town, the newspaper called out for "Miners of Bear Gulch, please come get your donkey." Later when the donkey died, it was buried with the miners. Tinton got its name from "Tin" for the tin mining there and 'ton' from Cornish translation for 'town'. The peak population in 1927-28 was 300 during the week. On weekends the temporary people walked to the railroad to Iron Creek to catch the railroad out. The last person in Tinton left in 1961, making it one of the last Black Hills ghost towns.